The Peugeot 205 is a supermini car produced by the French manufacturer Peugeot from 1983-1998. It was declared "car of the decade" by CAR Magazine in 1990. It also won What Car? 's Car of the Year for 1984. The styling of the 205 is often thought to be a Pininfarina design, although Gerard Welter claims it is an in-house design; Pininfarina only styled the Cabriolet. It is often credited as the car that turned Peugeot's fortunes around. Before the 205, Peugeot was considered the most conservative of France's "big three" car manufacturers, producing large saloons such as the 504 and 505, although it had entered the modern supermini market in 1973 with the Peugeot 104. The genesis of the 205 lay within Peugeot's takeover in 1978 of Chrysler's European divisions Simca and the former Rootes Group, which had the necessary expertise in making small cars including the Simca 1100 in France and Hillman Imp in Britain. It was around this time that Peugeot began to work on the development of a new supermini for the 1980s. It was launched on 24 February 1983, and was launched in right-hand drive form for the UK market in September that year. Shortly after its launch, it was narrowly pipped to the European Car of the Year award by the similar sized Fiat Uno, but ultimately (according to the award organizers) it would enjoy a better image and a longer high market demand than its Italian competitor. It was one of five important small cars to be launched onto the European market within a year of each other - the other three models being the Uno, the second generation Ford Fiesta, the original Opel Corsa (sold as the Vauxhall Nova on the British market) and the original Nissan Micra. Its launch also closely followed that of the Austin Metro and Volkswagen Polo MK2. The diesel models employed the XUD PSA Diesel inline-four engine, lifted from the Citroën BX which was introduced in September 1982. These XUD engines had a capacity of 1769 cc (XUD7) and 1905 cc (XUD9) and are closely related to the XU5 and XU9 petrol engines in the BX16 and BX19 of the time respectively, as well as the engines later used in the 205 GTI 1.6 and Automatic (also 1.6) and GTI 1.9 respectively (other Peugeot/Citroën [PSA] products, such as the 305 and Talbot Horizon as well as the BX, used the XUD9 1905 cc Diesel engine of the same capacity as the 205 GTI 1.9 and Citroën BX 19 petrol engined models). The XUD7 (and XUD9) Diesel Engines were world-beating and so petrol-like that many buyers were won over by petrol car performance combined with diesel economy. The 205 GRD (1.8 Diesel, 59 bhp (44 kW), 78 lb⋅ft (105.8 N⋅m)), for instance, was as fast yet smoother than the 205 GR (1.4 Petrol, 59 bhp (44 kW), 78 lb⋅ft (105.8 N⋅m)), due to the engine developing peak torque at much lower rpm, while using much less fuel. The 205 was an instant hit, and its styling was echoed in every Peugeot model that was to follow. The exterior styling was never facelifted or significantly altered in its 15-year production run. There was a dashboard redesign for the 1988 model year, and in late 1990 the 205 received new door design and cards, clear front indicators, new 'smoked' rear light clusters, single point petrol injection and catalytic converters were introduced, to meet the new 1992 pollution limits. These updates came at a crucial time, as 1990 also saw the arrival of a completely new French competitor, the Renault Clio, while the Rover Metro and Volkswagen Polo were also heavily updated, and Ford had already replaced its Fiesta with a third generation model. Still, the 205 was still widely regarded in the motoring press as the benchmark car in this sector by 1990. At the beginning of 1993, Peugeot launched the 306, which officially replaced the 309; the arrival of this car also diminished the 205's role (and its sales figures) in the Peugeot range, as had the arrival of the smaller 106 in September 1991 - although the final demise of the 205 was still some years away. The engines were continuously updated, with the new "TU" engines introduced in 1988. In 1991, the 205 dTurbo was launched with a powerful, turbocharged version of the 1,769 cc xud diesel engine. After several years of gradually declining sales, the Peugeot 205 was discontinued in the United Kingdom in 1996. The Peugeot 205 was still offered in the "Sacré Numéro" and "Génération" models until the end of the production in 1998, the last models were GLD 1.7 configuration and were sold in Argentina. Most of the later European versions were only sold in France. Due to the pressure from the market, with buyers wanting a Peugeot supermini in the mould of the 205 again, the company finally built a direct replacement in the 206, which was launched in 1998. 5,278,050 Peugeot 205s have been sold, and a significant percentage of them were still in circulation as of 2009. As of January 2014, there are now fewer than 14,000 on the road in the United Kingdom, compared to the peak high of 374,773 as of December 1994. With potentially as many 400,000 sales in the UK, it became the best selling car ever sold by Peugeot in the UK - although its success was emulated a few years later by the larger 306 and later by the 206. The 205 was first available as a GTI in 1984 (the same year that the three-door bodystyle debuted) and was initially powered by a fuel injected 1.6 petrol engine. The 1.9 GTI was launched in 1986 and the 1.9-litre engine was also used in the GTI version of the larger 309. The 205 GTI was discontinued in 1994, by which time Peugeot was producing high performance versions of the 106 and 306. Most of the versions had manual transmission. The 205 had a rather unusual trim level scheme for its models; three-door models (apart from the GTI) were badged 'X' and five-door models were badged 'G'. XA and XAD, two-seater commercial versions. There was also the "Multi", tall-bodied special versions built by independents such as Gruau and Durisotti. Five-door versions were badged GL (Note: The 1.0 litre GL was not offered in the UK). The 1.8 litre GLD diesel model was popular, and What Car? magazine recommended it as a Used Car Buy in August 1992. It was also a Which? magazine best buy for five years running in the late 1980s and early 1990s. It was, (and is as a used buy), a better car than the 106 diesel that replaced it. Five-door versions were badged GR. The 1.4 litre GR was a five-door version only, launched in 1986. A 1.4 litre XR three-door was also available, 1991-92. 1.4 litre petrol I4 - 85 bhp 1360 cc TU3S engine. 1,360 cc TU3M/Z PSA engine with Bosch Mono-jetronic injection system with Catalytic converter. Power output (75 bhp) 0-62 mph in 10.6 sec. Fuel consumption (MPG) constant speed driving: 56 mph (90 km/h) = 50.4 mpg‑imp (5.60 L/100 km; 42.0 mpg‑US) & 75 mph (121 km/h) = 38.2 mpg‑imp (7.39 L/100 km; 31.8 mpg‑US). 3 and 5-door versions were available with sliding sunroof, remote central locking, 5 speed MA gearbox. From 1994, the X/G trim scheme was replaced by Mardi Gras, Colorline, Forever and Accent. 'GT' versions were now offered only in Continental Europe with a 1.6 litre engine; the UK models were badged Mardi Gras. However, GTI versions continued unchanged. The 1.6 litre GTI was launched in 1984, and came with a XU5J engine, producing 105 PS (77 kW; 104 hp), for the 1987 model year the XU5J received the cylinder head with larger valves thus becoming XU5JA. The new engine was quoted for 115 bhp (86 kW; 117 PS). The 1.9 litre GTI came with an XU9JA engine producing 128 PS (94 kW; 126 hp), although later models with a catalytic converter produce 122 PS (90 kW; 120 hp). Internally these engines are very similar, the main differences on 1.9 litre versions being the longer stroke, oil cooler, and some parts of the fuel injection system. The shorter stroke 1.6 litre engine is famed for being revvy and eager, while the 1.9 litre feels lazier and torquier. Outside the engine bay the main differences between the 1.6 GTI and the 1.9 GTI are half-leather seats (1.9 GTI) vs. cloth seats (1.6 GTI); and disc brakes all-round (1.9 GTI) vs. discs at the front and drum brakes at the back (1.6 GTI); as well as the 14-inch (360 mm) alloy (Speedline SL201) wheels (1.6 GTI) vs. 15 inch (Speedline SL299) alloys (1.9 GTI). The 205 is still often treated as a benchmark in group car tests of the newest GTI models or equivalent. Peugeot itself has never truly recreated this success in future GTI models, although they came very close with the highly regarded GTI-6 variant of the Peugeot 306. A cabriolet version of the 205, known as the CJ (or CT in France), was designed and partially assembled by Pininfarina of Italy. A CTi version, with the same plastic arches and wheels as the 1.6 GTI was also available. Some later models incorporated the catalysed 1.9 litre engine. The main aesthetic difference between the GTI/CTi versions and other 205 models were the plastic wheel arches and trim, beefier front and rear bumper valances. The shell also underwent some minor changes, including larger wheel arches (to suit the larger wheels on the GTI and CTi), and the suspension was redesigned and sat lower on the GTI with stiffer springs, different wishbones and a drop-linked anti-roll bar. With the early success of the 205 GTI in Europe, Motor Trend reported in 1984 that Peugeot was seriously considering adding it to its US lineup, even though Peugeot had a more upmarket image in the United States. Nothing ever came of such rumours, however, and any talk of Peugeot expanding its presence in US became moot when it was forced to pull out in 1991. Sales of the GTI in the United Kingdom in the early 1990s were badly hit by soaring insurance premiums, brought about by high theft and 'joyriding' of cars of this sort. Increasingly stringent emissions regulations meant the 1.6 GTI went out of production in 1992, while the 1.9 litre was sold for a couple more years thanks to re-engineering of the engine to enable it to work properly with a catalytic converter, which dropped power to 122 bhp (91 kW; 124 PS). One of the 200 produced 205 T16 road version. 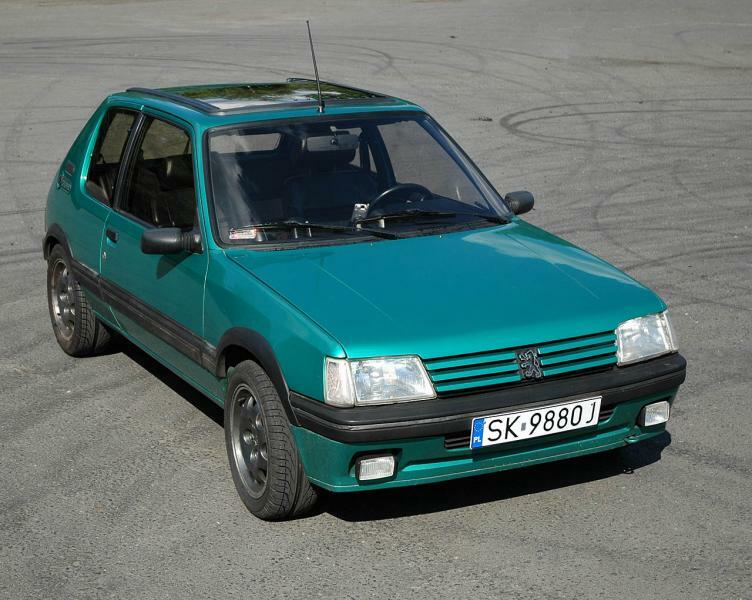 Across 1989-1990, 1200 GTIs were made in the then new colours of Miami blue (Bright metallic blue) and Sorrento Green (a very dark pearlescent green). The cars were made in an equal mix of 300 blue 1.6 litre, 300 green 1.6 litre, 300 blue 1.9 litre and 300 green 1.9 litre. The cars had a sliding sunroof, power steering and full grey leather interior as standard, together with grey carpets and doorcards. These paint colours were later added to the list of available colours for mainstream models. The Gentry was a limited edition version of the 205, although arguably not a GTI model as it used a detuned 105 bhp (78 kW; 106 PS) 1.9 litre engine with an automatic gearbox. Only 300 models were made in Sorrento Green and Aztec Gold (sometimes called Mayfair Beige). They came with full-leather and real wood trim, power assisted steering, ABS and heated mirrors. The Gentry came with the same body side trims as the GTI, which led to the Gentry often being mistaken for a GTI. The Griffe was a special GTI edition for mainland Europe, and was sold in France, Germany and the Netherlands. It was bright green (called 'Laser' Green or 'Vert Fluorite'), and came equipped with all available vendor options at that time except air-conditioning, but including full black leather interior, ABS, power steering and sunroof. 1652 Griffes were made, all in laser green and with dark grey anodised alloy wheels with a silver rim. The 1FM was produced for the UK market in 1992 to coincide with the 25th birthday of BBC Radio 1. Only 25 were made and each car was individually numbered with a small brass plate. The car was only available in black with 'Radio 1FM 25th' bodywork decals, grey Speedline alloy wheels and came with all options fitted as standard. A special stereo system including a CD changer and an acoustic rear shelf was specified by Clarion. Radio 1 ran a competition on air to win one. In 1993 Peugeot introduced the 205 and 405 STDT, a higher performance diesel model to sit between the standard diesel range and the higher end GTI cars. The 205 STDT (special trim diesel turbo) was available only in the 3-door bodyshell with a 1,769 cc turbo diesel engine (XUD7 T/K) with the trim and luxuries of the 205 GTI. The car was initially marketed towards executives, with soft cloth bucket seats in Beige with matching carpet and dashboard, as also found in the Gentry models. The car featured PAS, central locking, electric windows and also electrically heated mirrors. Many were fitted with a large, vacuum-seal slide sunroof. Acceleration - 0-62: 12.2 secs, 0-1000M: 34.2 secs. The 205 STDT is only found in three colours; 'Oberon Green', 'Steel Grey' and 'Aztec Gold'. Production of the car was approximately one year between 1993-1994. As of 2014, there are only 84 examples of the STDT left licensed on the roads and 118 SORN in the United Kingdom making the car quite sought after with collectors and fans of the 205. STDT models often found sell for more than the GTI model due to their economy and relative rarity when comparing production numbers of the vehicle versus decline. As of 22 December 2016, there are only 53 STDT's left on the roads and 131 SORN in the UK. As of 11 October 2018, there are only 34 STDTs left on the roads and 139 SORN in the UK. From 1988 to 1992 Peugeot produced another variant of the 205, the 205 Rallye, which was engineered and produced by Peugeot-Talbot sport. This edition of the 205 was positioned as a cost effective alternative to the 205 GTI, retaining its sporty character, but being less expensive to buy or maintain. To achieve this, Peugeot used a derivative of the TU-series engine used in the post-1987 205s, which was designated TU24. The engine is essentially the same engine as was in the 1.1 litre 205 with the cylinders bored out to a total engine displacement of 1294 cc, a sports camshaft and twin Weber carburetors. The 1.3 litre engine produced 103 PS (76 kW; 102��hp) at 6,800 rpm. The car got the 1.6 GTI front suspension with ventilated brake discs, and the 1.6 GTI rear axle with drum brakes. The 205 Rallye was completely stripped of almost all soundproofing, electrical systems or other luxury items, bringing down the weight to no more than 794 kg (1,750 lb). Its minimalistic equipment, together with the high revs needed to unleash all of the engine's horsepower gives the 205 Rallye a very spartan character and makes it a difficult but rewarding car to drive hard, which is one of the reasons it is now very popular among 205 GTI enthusiasts. Peugeot expected to build around 5000 Rallyes. In the end 30,111 Rallyes were produced, even though they were only sold in certain mainland European markets (including France, Belgium, Portugal, Spain, Italy and The Netherlands). The distinctive aesthetic features of the 205 Rallye include the squarer wheel arches (which are different from GTI arches), the steel body-coloured wheels and the rainbow-coloured Peugeot-Talbot sport decals on the front grille and the tailgate. They were only available in white. The Rallye was sold with a reduced-weight interior with the Peugeot-Talbot sport logo embroidered in the front seats. From 1990 to 1992 Peugeot also built a 1.9 litre version of the 205 Rallye. Only about 1000 of them were produced and they were only sold in Germany, because the 1.3 litre version did not meet German road regulations. The 1.9 Rallye is just a 105 bhp (78 kW) 1.9 GTI with the Rallye bodyshell and the new-style clear indicators and rear light units. Although they are even rarer than the 1.3 Rallye, they are less popular among Peugeot enthusiasts, because they lack the raw and spartan character of the 1.3 Rallye and are 150 kg (331 lb) heavier. In 1994 Peugeot introduced the Rallye to the UK market, it was available in three colours (500 white, 250 yellow, 80 blue) and was essentially a re-badged XT. It came equipped with black cloth seats embroidered with the Peugeot-Talbot Sport logo, the Peugeot-Talbot sports colours behind the front arches and over the back arches, as well as the same markings on the grill and tailgate of its European brother. It was powered by an iron-blocked 1360 cc TU3.2 engine with the same twin-choke Solex carburettor found on the earlier XS engine. It produced 75 bhp (56 kW; 76 PS) and achieved 107 mph (172 km/h) with a 0-60 mph of 11.7 seconds. After the 205 Rallye, Peugeot again used the 'Rallye' designation for some of its 106 and 306 models. To homologate the 205 T16 ("Turbo 16" in France) Group B rally car, Peugeot had to produce 200 road-going examples. According to the Group B regulations, these had to be based on a current production road car. Peugeot decided to base the Group B rally car on the two door version of the 205. The engine was based on the cast iron block of the Diesel version of the then new XU engine family, albeit with a specially developed 16-valve head. The gearbox came from the Citroen SM but was mounted transversely. The car had all wheel drive. The body was built by Heuliez, where standard three door bodyshells from the production line were delivered and heavily modified. Heuliez cut off the complete rear of the car and welded in a transverse firewall between the B-posts. The rear frame was then built in a mixture of sheet steel profiles and tubes. The front was modified in a similar way with a tube frame carrying the front suspension. The completed bodies were delivered to Simca (Talbot) for the 200-series production cars and to Peugeot Talbot Sport for the competition versions. All street versions (VINs P1 to P200) were left hand drive and identically kitted out in dark grey colour, except the first (VIN P1) that was painted white and carried all the competition cars’ decoration for demonstration purposes. The competition cars of the first evolution series (VIN C1 to C20) were built at the sport department Peugeot Talbot Sport and presented to the public at the same day as the standard street version. Later competition vehicles of the Evolution 2 series (VIN C201 to C220) were built differently as the rear spaceframe had no more sheet steel profiles in it but was completely made from tubes only. Apart from the appearance, the road variants had practically nothing in common with the regular production model and shared the 1,775 cc (1.8 L; 108.3 cu in) with a bore x stroke of 83 mm × 82 mm (3.27 in × 3.23 in) transversely-mounted, mid-engine, four-wheel-drive layout of the rally car, but had less than half the power; at around 200 PS (197 bhp; 147 kW) at 6,750 rpm and 255 N⋅m (188 lb⋅ft) at 4,000 rpm of torque. The T was for (KKK) Turbo, fuel fed by Bosch K-Jetronic fuel injection and a compression ratio of 6.5:1; the 16 stands for DOHC 16 valves. Outwardly similar to a normal 205, the T16 had wider wheel arches, and the whole rear section lifted up to give access to the engine. Underneath, the complex drivetrain from the rally car was kept to abide by the Group B rules. In addition to the Group B model, the lesser 205 GTI was also FIA approved for competition in the Group N and Group A categories. Peugeot 205 Turbo 16 Dakar. ^ "Driven: Peugeot 205 GTI and T16 | Features | octane". Classicandperformancecar.com. 23 February 1983. Retrieved 24 August 2011. ^ "Previous winners". Car of the year. Archived from the original on 21 June 2012. Retrieved 4 December 2010. ^ a b Bellu, René, ed. (September 1990). "Salon: Toutes les Voitures du Monde 90/91". l'Auto Journal (in French). Paris: Homme N°1 (14 & 15): 182–183. ISSN 0005-0768. ^ Büschi, Hans-Ulrich, ed. (8 March 1990). Automobil Revue 1990 (in German and French). 85. Berne, Switzerland: Hallwag AG. p. 487. ISBN 3-444-00495-8. ^ "1999 Peugeot 205 Review". carsurvey.org. 27 September 2004. ^ Olly Smith. "Combined stats (70 models) PEUGEOT 205 - How Many Left?". Howmanyleft.co.uk. Retrieved 18 December 2011. ^ Picture: "Serie Specjalne: Griffe". Peugeot 205 Fan Klub. Archived from the original on 7 November 2007. ^ "Peugeot 205 Hatchback (83-97) 1.8 STDT 3d - MPG, Dimensions & Performance - Parkers". parkers.co.uk. ^ Olly Smith. "PEUGEOT 205 STDT - How Many Left?". howmanyleft.co.uk. ^ "PEUGEOT 205 STDT". Howmanyleft.co.uk. Retrieved 22 December 2016. ^ "PEUGEOT 205 STDT". Howmanyleft.co.uk. Retrieved 11 October 2018. ^ "1984 Peugeot 205 Turbo 16". automobile-catalog.com. Retrieved 14 June 2018. ^ Bridier, Gérard (April 1985). "Courir en... Peugeot 205 GTI" [Racing a... Peugeot 205 GTI]. Echappement (in French). Paris, France: Michael Hommell (198): 147. Wikimedia Commons has media related to Peugeot 205.